Mindfulness meditation practice couldn’t be simpler: take a good seat, pay attention to the breath, and when your attention wanders, return. By following these simple steps, you can get to know yourself up close and personal. At the outset, it helps to set an amount of time you’re going to “practice” for. Otherwise, you may obsess about deciding when to stop. If you’re just beginning, it can help to choose a short time, such as five or ten minutes. Eventually, you can build up to twice as long, then maybe up to 45 minutes or an hour. Use a kitchen timer or the timer on your phone. Many people do a session in the morning and in the evening, or one or the other. If you feel your life is busy and you have little time, doing some is better than doing none. When you get a little space and time, you can do a bit more. Here’s a posture practice that can be used as the beginning stage of a period of meditation practice or simply as something to do for a minute, maybe to stabilize yourself and find a moment of relaxation before going back into the fray. If you have injuries or other physical difficulties, you can modify this to suit your situation. 1) Take your seat. Whatever you’re sitting on—a chair, a meditation cushion, a park bench—find a spot that gives you a stable, solid seat, not perching or hanging back. 2) Notice what your legs are doing. If on a cushion on the floor, cross your legs comfortably in front of you. 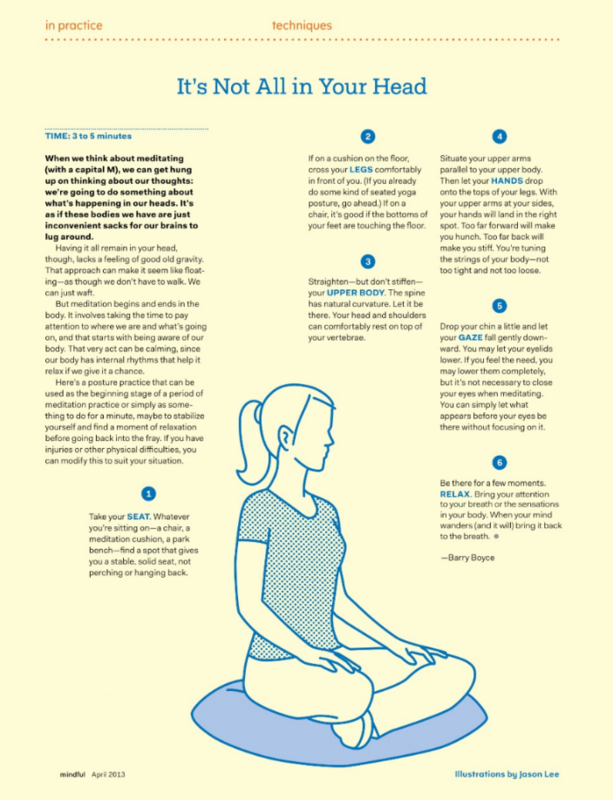 (If you already do some kind of seated yoga posture, go ahead.) If on a chair, it’s good if the bottoms of your feet are touching the floor. 3) Straighten—but don’t stiffen—your upper body. The spine has natural curvature. Let it be there. Your head and shoulders can comfortably rest on top of your vertebrae. 4) Situate your upper arms parallel to your upper body. Then let your hands drop onto the tops of your legs. With your upper arms at your sides, your hands will land in the right spot. Too far forward will make you hunch. Too far back will make you stiff. You’re tuning the strings of your body—not too tight and not too loose. 5) Drop your chin a little and let your gaze fall gently downward. You may let your eyelids lower. If you feel the need, you may lower them completely, but it’s not necessary to close your eyes when meditating. You can simply let what appears before your eyes be there without focusing on it. 6) Be there for a few moments. Relax. Bring your attention to your breath or the sensations in your body. 8) Inevitably, your attention will leave the breath and wander to other places. Don’t worry. There’s no need to block or eliminate thinking. When you get around to noticing your mind wandering—in a few seconds, a minute, five minutes—just gently return your attention to the breath. 9) Practice pausing before making any physical adjustments, such as moving your body or scratching an itch. With intention, shift at a moment you choose, allowing space between what you experience and what you choose to do. 10) You may find your mind wandering constantly—that’s normal, too. Instead of wrestling with or engaging with those thoughts as much, practice observing without needing to react. Just sit and pay attention. As hard as it is to maintain, that’s all there is. Come back over and over again without judgment or expectation. 11) When you’re ready, gently lift your gaze (if your eyes are closed, open them). Take a moment and notice any sounds in the environment. Notice how your body feels right now. Notice your thoughts and emotions. Pausing for a moment, decide how you’d like to continue on with your day. That’s it. That’s the practice. It’s often been said that it’s very simple, but it’s not necessarily easy. The work is to just keep doing it. Results will accrue. If you want to learn more about mindfulness and how to practice mindfulness meditation, visit Mindful’s Getting Started page.